There was once a wise man I met who said "Never save your prized bottles of wine for too long..."
His thinking, if I remember, was that one can in fact save those prized bottles of wine until they become prized bottles of vinegar. Hardly a fitting ending for a wine that one might cherish and hold dear, looking at fondly in the wine cellar for months or years thinking "One day it will be the right day - but not today"
The wise man would say that a good episode of Castle might be cause enough for celebration with a great bottle of wine, and tonight was such a night. My mother-in-law and sister-in-law were at the house for dinner, we had my wife's birthday a week ago, the mother's birthday is also coming around the corner and Mother's Day soon to be celebrated for the first time in our house. Definitely time for some wine. Chateau LaFleur Saint-Jean is a modest vineyard of about 1.2 hectares in Pomerol, Bordeaux, France. The main varietal grown is Merlot, although there is a small amount of Cabernet Franc as well (about 10%). The wine is much sought after in Belgium and Germany, and has acquired a following in England as well... in North America it is rather unknown which is a shame considering the quality. 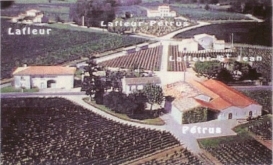 If one could judge the quality of the wine only by the quality of the neighbours, one needs only learn that LaFleur Saint-Jean is almost cheek-to-cheek with Chateau Petrus to understand what lies beneath the surface. Perhaps a small winery, but one worthy of notice. 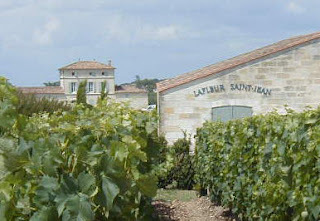 The wines invariably reach scores over 90, and Francois Janoueix is being hailed as the man who took a beautiful heritage house - modernized the wine facilities, and meshed them seamlessly together into one incredibly package.